We are at the beginning of Spring fertilizer season and it’s time to prepare. The question we ask when it comes to fertilizer is the size of the lawn. The most common answer is average. We are actually looking for the number of square feet of grass. It doesn’t have to be to the foot but since the average is 1,000 to 7,000 any number is better than average. The one thing that is for certain, we all need to apply nitrogen (the first number in fertilizer) a couple of times a year. Nitrogen is the big consumable in fertilizer. It is used for plant growth and it can also evaporate and be washed off. Phosphate and potash (second and third numbers) can be anywhere from too much to non-existent. A soil test will help you determine if there is enough or not enough of these nutrients (and others) in the soil. By the way, Wells Brothers does soil testing. We all need to apply a measured amount of water to the applied fertilizer. Not enough water can cause burning with synthetic fertilizers (mainly from salt) and too much will cause runoff. Fertilizer runoff has been linked as one of the causes of algae blooms in lakes and ponds. If you use the correct amount of fertilizer it will take less water to get it to where it needs to be. Because some types of water restrictions are the new normal, it is tempting to get that fertilizer out before the rain. I am telling you it is a bad idea to apply fertilizer before a rain for the reasons stated above. However, it is a very good idea to apply your fertilizer after a rain when the ground is wet. You still need to put some water on it but it will only take a small amount. See more about fertilizer help by clicking here. Some of the all-natural fertilizers we offer include Texas Tee (6-2-4), Medina Dry (3-2-3), and Make it Green (10-1-1). Our flagship fertilizer is the (almost) world famous “Dirt Diet”. It is a 4-1-2 in a 50# bag. Synthetic fertilizers include Wells Brothers own 16-20-0 and 28-6-6. Both of these have 12% sulfur and the 28-6-6 contains 2% iron. We also carry 21-0-0, 13-13-13, 46-0-0 and the exceptional 24-0-0. Rounding out the mix is a good selection of Ferti-Lome and Hy-Yield products. 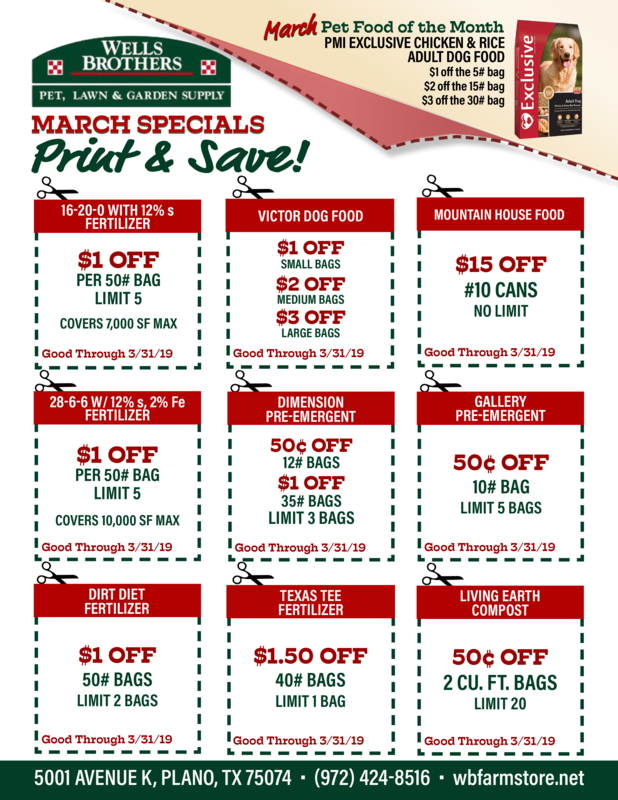 If your lawn or garden soil is in need of a particular item, chances are we have it. Wells Brothers has a fertilizer bar. Since we are happy all the time there is not a specific happy hour! 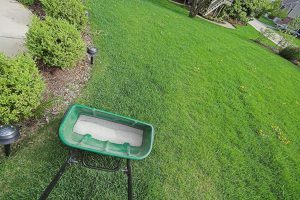 Armed with detailed soil analysis and the proper nutrients, a lawn or garden can grow beyond expectation. Below are the macro and micronutrients we carry. Some of these products are available in both large and small quantities. Boron (B), iron (Fe), manganese (Mn) and zinc (Zn).